Gordon’s Bay is a sleepy seaside village in South Africa, nestled in the northeastern corner of False Bay, where the majestic Hottentots Holland mountain range dips its toes into the ocean. A quick 50-minute drive from Cape Town, Gordon’s Bay is surrounded by mountains and natural vegetation and the vibrant beauty of the countryside is mirrored beneath the waves. Klipfish on reef at Steenbras Deep, Gordon's Bay, South Africa. Photo by Kate Jonker. 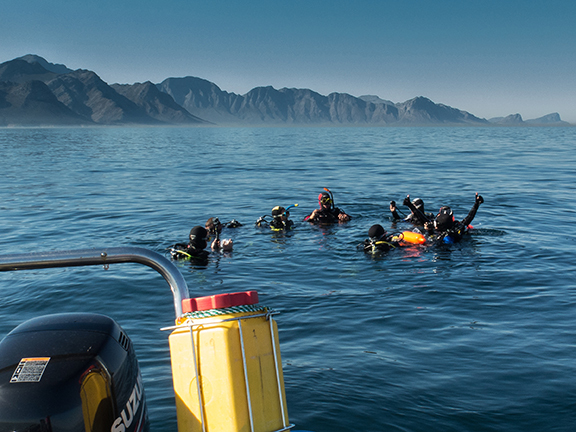 Most of the dive sites run parallel to the rugged coastline that stretches along the eastern coast of False Bay. The many dive sites offer something for every diver—from shallow reefs and kelp forests to deeper, craggy reefs with incredible topography. 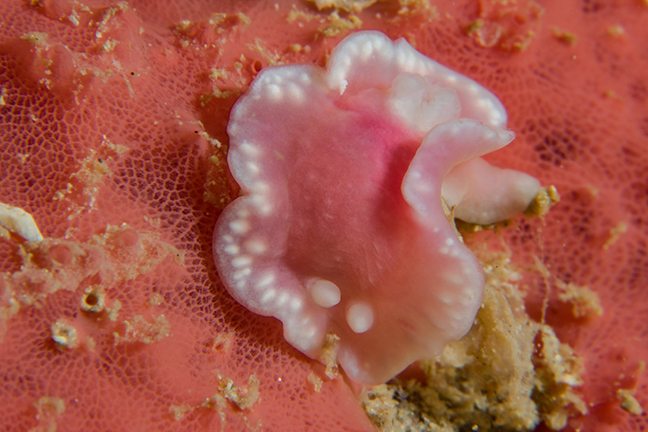 Fed by nutrient-rich waters, the marine life flourishes in Gordon’s Bay and dive sites are densely covered with colourful soft corals in pinks, oranges, greens and purples. Sinuous, palmate and whip fans sway gently in the ever-changing tide, and yellow, pink, purple and orange sponges adorn the rocks. Vibrant starfish, anemones, feather stars and sea urchins add to the riot of colours, and beautiful pink and orange noble corals can be found proudly standing guard on the deeper reefs. This base of vibrant life provides a safe and thriving habitat for the multitude of vertebrates and invertebrates that inhabit the reef. 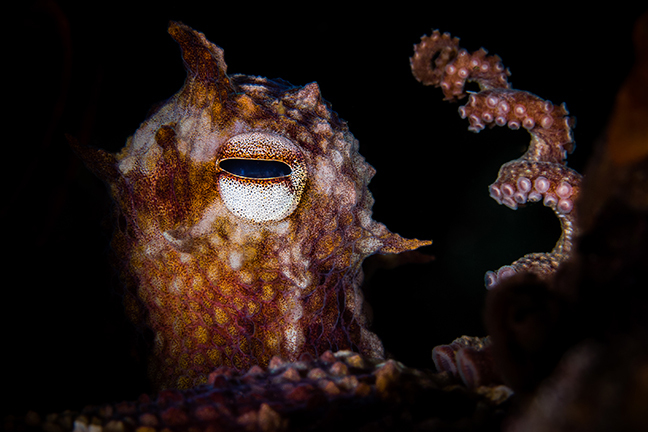 From colourful nudibranchs in all shapes and sizes, to crazily decorated spider crabs, hard-to-spot cuttlefish and octopus with their ever-changing textures and colours to small catsharks and reef fish—there is so much to see. Gordon’s Bay is a haven for macro photographers, and the variety and number of nudibranchs on any one dive is astounding. 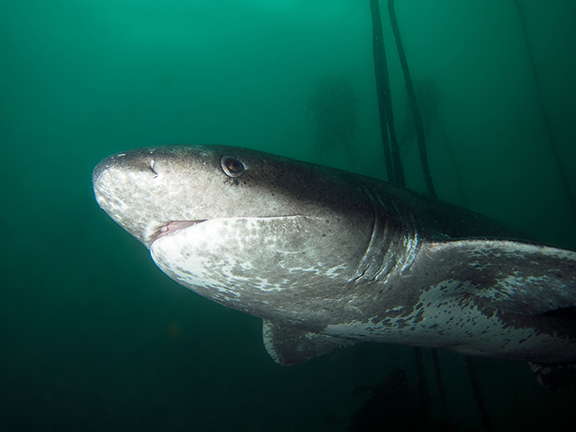 Larger visitors to the reefs include huge short-tail stingrays, sevengill cow sharks and gully sharks, Cape clawless otters, dolphins, Bryde’s whales and many playful Cape fur seals, which often follow divers around underwater. Gordon’s Bay is the only town in South Africa that sports two working harbours—the quaint and rustic old harbour, which is home to South Africa’s Naval Officer Training College and the Gordon’s Bay NSRI; and the newer harbour at Harbour Island, where the dive boats launch from. Most dive sites are situated between 10 and 40 minutes from Harbour Island. As most of the reefs are close to shore, the scenery of the mountains and rugged coastline to and from the dive sites is breath-taking. 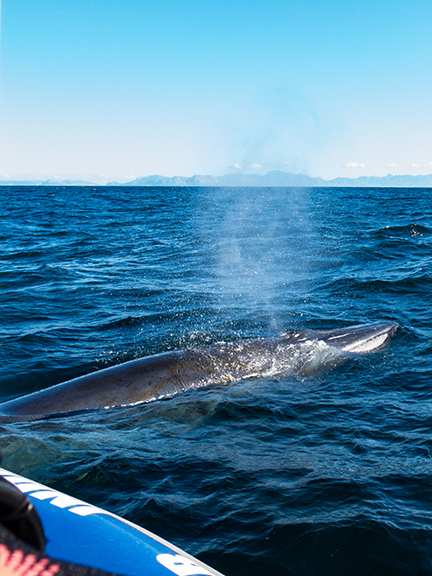 Divers will often encounter dolphins, seals and whales along the way, making the ride out to the dive sites almost as exciting as the dive itself. Cape Town diving is very seasonal and where you dive will depend on what time of year you visit. Sea conditions are affected by the prevailing winds. 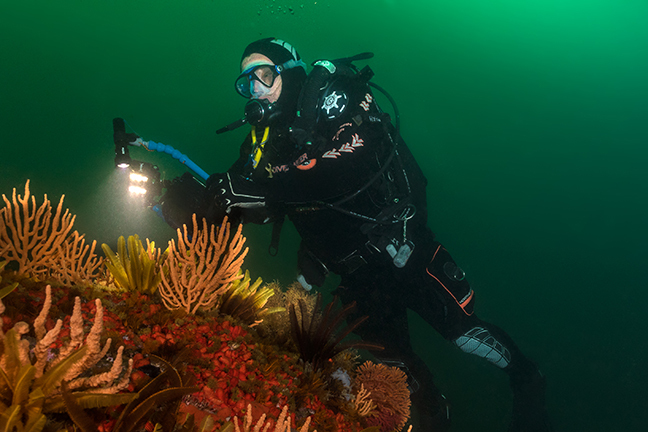 The south-easterly wind blows from October to May, clearing the water along the Gordon’s Bay side of False Bay, bringing great diving conditions. 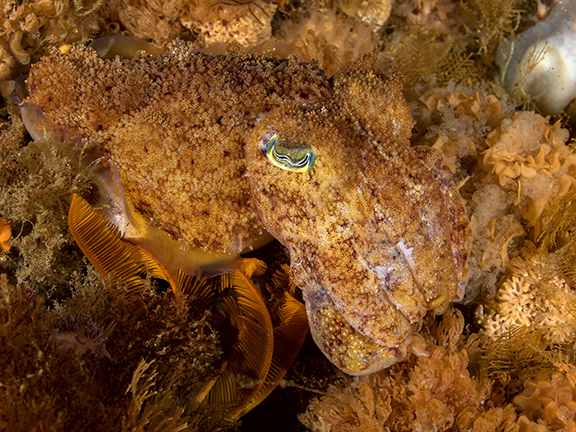 From June to September, the north-westerly winds blow and diving in Gordon’s Bay is not usually possible as conditions are too rough and the visibility drops. The best time to visit Gordon’s Bay is therefore from October to May. Water temperature in Gordon’s Bay can change daily and is affected by the tides and the water coming into False Bay. Temperatures usually range between 15°C and 19°C in summer, with the odd drop to 13°C. Divers are advised to wear either a 5mm wetsuit and hooded chicken vest or a 7mm wetsuit with a hoodie. Many local divers also dive with semi-dry or drysuits. Gloves, a hoodie and booties are also a must in order to stay warm. The diving is done from eight-metre-long rubber ducks, known as RIBs or zodiacs in other parts of the world. The standard procedure is for divers to put their gear together on land and load it onto the boat, where the skipper will secure it to dive racks. Divers then don wetsuits and booties, and climb on board. Once at the dive site, the divers kit up for the dive, usually with the assistance of a dive guide or the skipper. When everyone is ready to enter the water, the skipper will slowly count, “One, two, three, go!” And the divers all roll backwards into the water at the same time on the word “go”. Divers can usually choose to dive with a dive guide or in buddy pairs, exploring the reefs at their own pace. This is an ideal arrangement for photographers who can take their time instead of rushing to keep up with the dive guide. At the end of the dive, divers deploy their surface marker buoy and the dive boat will come to pick them up. It is therefore important that all divers have their own deployable surface marker buoy with them on every dive. Indigo Scuba (indigoscuba.com) is the only dive centre in Gordon’s Bay. All their skippers, dive guides and instructors have been diving and exploring the reefs in this area since the 1990s. They have an immense knowledge of the reefs, many of which they have discovered over the years. Visiting divers are also able to rent any dive gear they might need from Indigo Scuba, and as the owners are accomplished underwater photographers themselves, underwater photographers are well looked after. As there is only one dive centre in Gordon’s Bay, the dive sites are pristine and well preserved, giving divers an opportunity to experience unspoilt Cape Town diving at its very best. Cow and Calf. From the road that winds its way along the rugged coastline, the two large rock outcrops of this dive site can be seen breaking the water close to shore. They look just like a mother whale and her calf, giving this beautiful dive site its name. 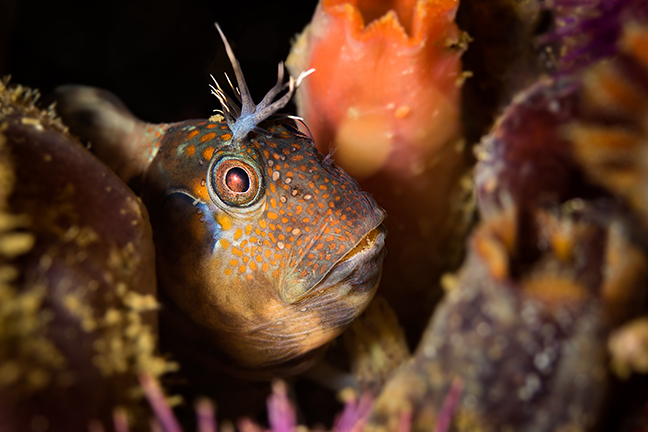 On the cow and calf pinnacles, you will find palmate and flagellar sea fans, soft corals, feather stars and urchins. Living amongst them is a multitude of nudibranchs, including soft coral, black, gasflame and fiery nudibranchs and Cape dorids. Fish life includes rock suckers, klipfish of all shapes and sizes, Cape triplefins and puffadder shyshark. Playful young Cape fur seals are often found here and love to follow divers as they explore the reef. Stone Dog. 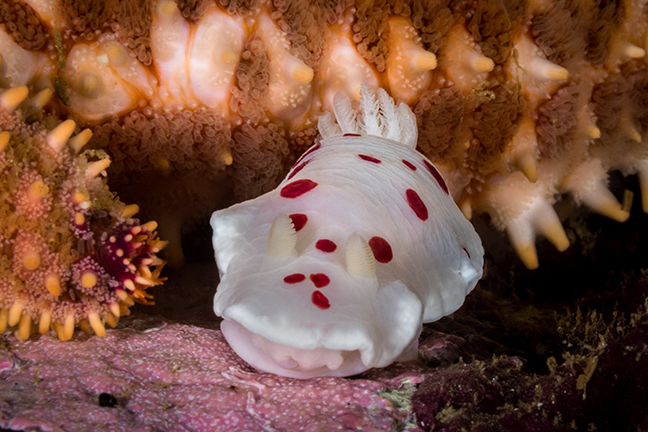 Fantastic for macro photographers, this is home to the rare protea dorid and one of the very few places that this elusive little nudibranch can be spotted. Small Chinese klipfish and blennies hide amongst the cracks and little puffadder shysharks can be seen patrolling the reef for food. Pinnacle. 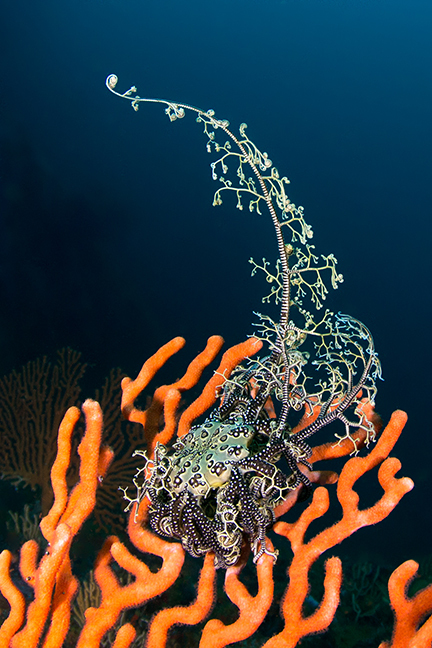 Highlights of this dive site include the many sea fans covered with whip fan nudibranchs and spider crabs. Huge orange wall sponges host giraffe-spot nudibranchs and provide hiding places for juvenile fish. The boulders farther away from shore are a grazing ground for red spotted dorid, Cape dorid and beautiful purple and yellow inkspot nudibranchs. Longsnout pipefish can be found wafting in and out of the sinuous sea fans and shy doublesash butterflyfish with their unmistakable yellow and brown bands can also be seen flitting around the outer edges of the reef. Noble Reef. The deepest dive site close to shore, Noble Reef is named after the vibrant pink and orange noble coral that grows on the deeper ridges here. This is the only true hard coral to be found in Cape waters. Starting at a depth of 15m and dropping to depths of 24m on the sand, this colourful reef comprises steep-sided pinnacles and sloping ridges lush with marine life. Both orange and blue gasflame nudibranchs can be found here and beautiful basket stars are often seen with their arms unfurled as they catch morsels of food that drift by in the ebb of the ocean. Steenbras River Mouth. This fascinating dive site is located where the Steenbras River meets the ocean. Close to the mouth of the river, the sea floor is a bed of round boulders which have been shaped by time, river and ocean. Venturing away from the river mouth, the underwater topography changes to steep-sided ridges that run parallel to shore, with canyons and sandy stretches in between. Huge overhangs provide a safe haven for sleeping pyjama sharks, larger reef fish and short-tail stingrays. Well-camouflaged rock suckers and octopus hide in plain sight on the reef, waiting to be spotted by eagle-eyed divers. Blousteen. Located 40 minutes away from Harbour Island, towering cliffs and lush mountains provide a majestic backdrop. 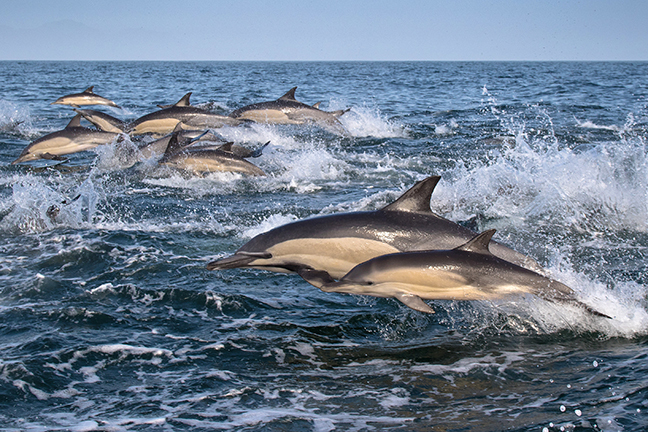 Playful seals and dolphins also supply endless entertainment en route to this vibrant dive site. Starting at 7m and reaching 20m farther from the shore, this is a wonderful kelp forest dive. Blousteen is home to a variety of unusual nudibranchs such as Catriona casha, many fish as well as shysharks, gully sharks, and sevengill cow sharks. Huge short-tail stingrays can be seen resting amongst the kelp and seals often pop down to visit the divers here. Steenbras Deep Reefs. The topography of the Steenbras Deep reefs can only be described as majestic, with ragged, steep sided pinnacles starting at 15m and plunging to 32m on the sand. The pinnacles are carpeted in yellow, orange and brown feather stars, delicate strawberry anemones, pink and orange noble coral, massive orange wall sponges, huge forests of sinuous and palmate sea fans and weirdly shaped grey sponges that resemble elephants’ ears. Large schools of silver fish swarm around the tops of the pinnacles, comical horned blennies grin out from cracks in the reef, huge bull klipfish stare superciliously at divers and cute little klipfish peer expectantly up at photographers. Nudibranch life is outstanding, with swarms of frilled nudibranchs that congregate to breed and eat on the multi-coloured sea fans. 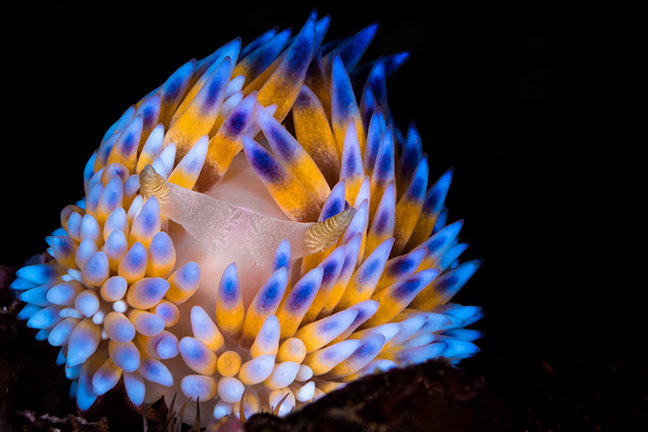 Tiny candy, white-edged and purple lady nudibranchs are found atop the pinnacles and orange and blue gasflames the size of dinner plates can be seen chomping their way across the reefs. Drop Zone. Drop Zone is quite a distance from Harbour Island and, like Steenbras Deep, can really only be dived in calm conditions due to the relatively long boat ride. This is a huge, dome-shaped reef that starts at 15m and gradually deepens to 25m and more. The reef is covered with craters, giving an impression that bombs could have been dropped here (hence the name “Drop Zone”). Due to its distance from shore, the marine life is very different here. 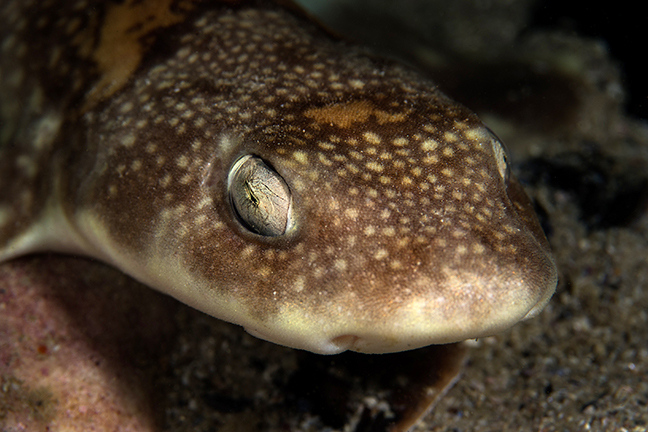 Game fish such as yellowtail amberjack and Cape salmon can be seen swimming by and eagle rays, leopard and pyjama catsharks are often encountered by divers. 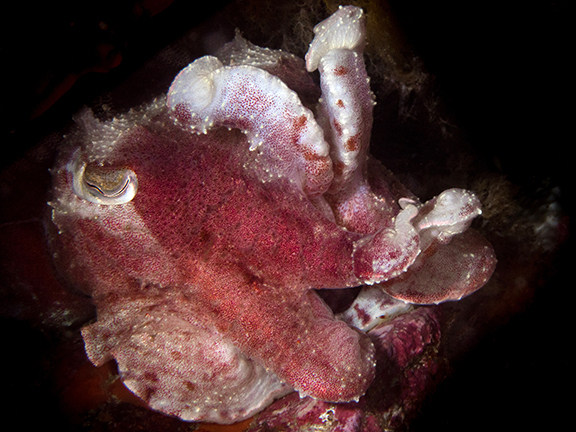 The smaller marine life is also incredibly diverse and includes sea spiders and interesting nudibranchs such as uniquely patterned variable dorids, ghost nudibranchs and Mandela’s nudibranchs. Cuttlefish and octopus are plentiful as are the beautiful basket stars that make their home on the reef’s many sinuous sea fans. Gordon’s Bay is Cape Town’s hidden gem. With its richly diverse, colourful marine life and incredible underwater topography, Gordon’s Bay diving is very different to that offered along the western side of False Bay. 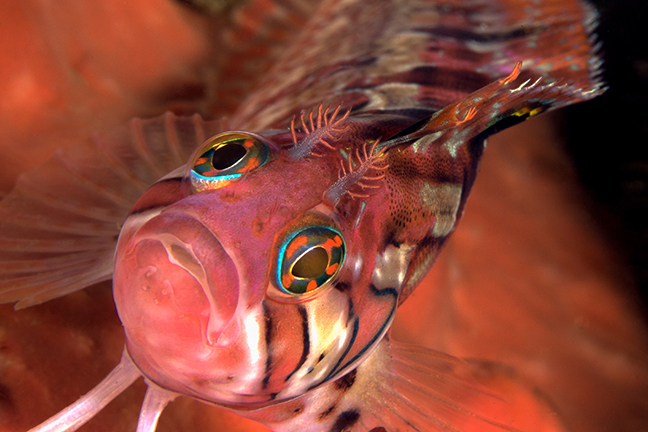 It is a must-visit for underwater photographers, particularly macro photographers who enjoy critter hunting. Being easily accessible and within close proximity to Cape Town, Gordon’s Bay should be on the itinerary of all divers visiting Cape Town. Getting there. Gordon’s Bay is a short 50-minute drive from the centre of Cape Town, straight down the main highway, the N2. Accommodation. Lodging in Gordon’s Bay is plentiful and there is something to suit every budget. It is advisable to book accommodation in advance as Gordon’s Bay is a popular holiday destination during the months of October to May. Eating out. The many restaurants in Gordon’s Bay offer a wide variety of cuisine—from pizzas, pasta, steaks, burgers, seafood, sushi, vegan, vegetarian and everything in between. There are a number of restaurants at both harbours where guests can sit outside, enjoy beautiful ocean views and watch the world go by. Many of the restaurants are family friendly and there is a local Spur on the Gordon’s Bay beach front that has a special games area for children. Topside activities. 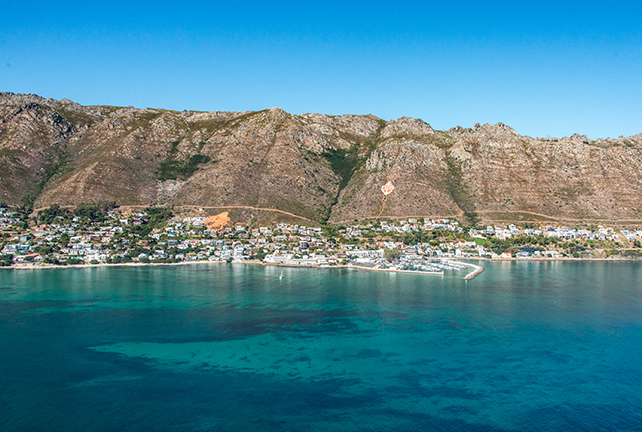 Gordon’s Bay is easily accessible and centrally located for visits to the magnificent Cape Winelands, surrounding sparkling white beaches and the beautiful nature reserves and hiking trails close by. There are many activities to keep non-divers and families entertained. The sandy main beach in Gordon’s Bay is very shallow and wave-free, providing safe swimming and paddling for small children. The neighbouring seaside village of Strand is 10 minutes away and has a beautiful long, sandy beach with great waves for surfers of all levels. Other water sports on offer in Gordon’s Bay include kayaking and standup paddleboarding, ocean safaris and sunset cruises. Those wishing to get away from the beach can explore the many local nature reserves, visit Monkey Town or the Cheetah Outreach. With the Stellenbosch wine route a mere 20 minutes away, wine enthusiasts will be spoilt for choice. Most of the wineries have their own restaurants, many of which offer world-class cuisine and breath-taking views over False Bay and the Cape winelands. Kate Jonker is an underwater photographer and writer based in South Africa. A proud member of the British Society of Underwater Photographers, she teaches underwater photography, is an SSI Dive Control Specialist and dive boat skipper, and leads dive trips across the globe. For more information, please visit: KateJonker.com.